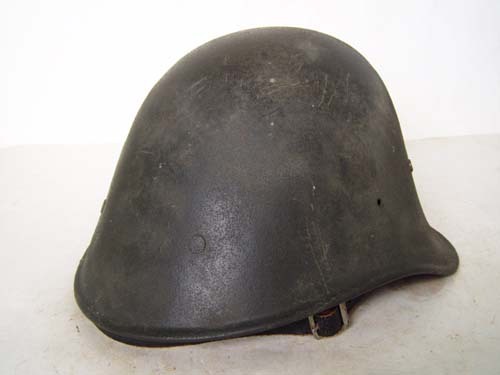 This odd looking helmet is sometimes known as the Romanian M38/42. The helmet is actually of Dutch manufacture. After the Germans overran the Netherlands, they confiscated the Dutch army helmets and sent them to be re-worked at the Litzmannstadt Ghetto in occupied Poland. The helmet were stripped of Dutch paint and repainted with rough textured German field gray paint. 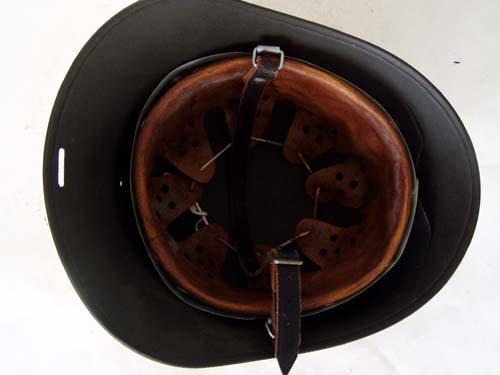 A steel bracket was then riveted inside the front of the helmet. This bracket was used to install the German M31 liner band, which was attached backwards to the bracket with the use of a split pin and slotted washer. These helmets were then issued to the Romanian forces who fought along side the Germans on the Russian front.